There have been 28 goals scored in the first five games of this series between the Blues and Sharks. Eight (8) goals have been scored by a player who’s last name begins with a “B”. Nine (9) goals have been scored by a player who’s first name begins with a “J”. A wish for a pleasant Tuesday to you and your minions of happiness. Most people know I am a very casual hockey fan. I used to be a devoted Blues fan until the “Iron” Mike Keenan regime destroyed my enjoyment of the game. 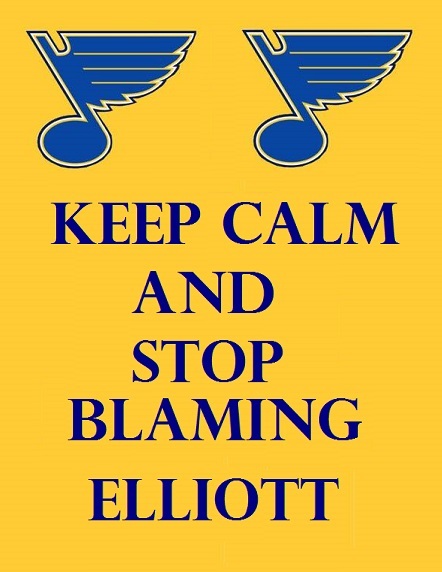 Regardless, every year I ‘adopt’ a player from the Blues and that is the guy I root for to succeed – normally he is an underdog. The last couple of years the player that I pull for wearing the blue winged note on the jersey is: Brian Elliott. Spanning three rounds of the playoffs, Elliott has been the guy. Did he have a clunker in each round? Yes he did. But he always bounced back to silence his critics. So when he had his clunker in this round, the issue was blown out of proportion by the fact that his team did not put any…I repeat ANY pucks in the net for two consecutive games. So even if he had only let in 1 goal – the team still loses. Hockey is funny like that. You don’t win any games that you don’t score in. So when the coach of the St Louis Blues (Ken Hitchcock) benched Elliott in favor of Jake Allen I was naturally put off. Allen turned in a Elliott-esque performance in game 4, making 31 saves and allowing 3 goals. This was similar to game one in which Elliott made 31 saves but only allowed 1 goal. So naturally when Allen faltered in game five (at home), everyone is wondering what the coach will do with his goal-tending rotisserie. I would think neither goalie would feel all that confident between the pipes. I wold think the gut feeling would be that if you give up a goal, whether a fluke or well-earned, all eyes will be on you. Talk about pressure. In my opinion, I think Elliott deserved to be back in there for games 4 and 5. When the team scores goals in front of him, Elliott has proven to be up to the task. This piece is not a knock on Jake Allen in any form. It is more of an indictment on the coach and the handling of a delicate team chemistry and confidence situation. Coming up in game 6 the Blues are facing an elimination game. In elimination games, the Blues are 2-3. The Blues had chances to eliminate their opponent twice in the first series (vs the Chicago Blackhawks) and lost the first attempt while having the elimination advantage and came through in the second attempt where either team could be eliminated (game 7). In the second round, the Blues failed twice in elimination games (vs the Dallas Stars) before coming through on the third try (game 7). The difference now becomes that the Blues are in the hot seat to be eliminated as opposed to the two series prior when they reached three wins first. If San Jose is paying attention, they have something in their favor and something going against them. Going in their favor is the Blues are 0-2 in these playoffs in game sixes. Going against them is the Blues are 6-3 on the road in the playoffs. So San Jose probably does not want to push their luck to game 7 where the Blues are 2-0 and have won one each at home and one the road. Be safe out there. Peace. Epilogue: In game four where the Blues won by scoring 6 goals (two empty netters), the Sharks starting goalie (Jones) gave up 4 goals on only 19 shots and got pulled. Guess who the Sharks’ coach put back in there for game five? Yep, their coach showed faith and put Jones back in there and he responded. Everyone has an off game here and there.